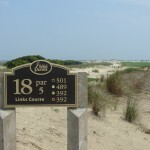 It was another sweltering hot day for the Lowcountry on June 12, but that didn’t deter several groups of golfers from enjoying the first day of the return of the 18th hole at Wild Dune’s Links Course. After erosion took a large bite out of the famed oceanfront hole, it took close to twenty months to restore the course to its former grandeur. But the wait was entirely worth it. Framed by a 180 degree view of the wild Atlantic ocean, the redesigned portion of the Links Course includes both the 17th and 18th hole. Tom Fazio, the original designer of the course, took a personal interest in the project since the Links Course was the golf architect’s first solo design. To ensure that everything went to plan, Forrest Fezler, one of the original course designers and president of Fezler Golf, stayed close to the resort and monitored the course’s construction; along with Fazio design associate Bryan Bowers and senior design associate Andy Banfield. In honor of the reopening of the 18th hole, Charleston residents are invited to be a “friend” of Wild Dunes for the summer and enjoy the Friends Program rate of $85 per round of the Links Course for the months of June and July. Tea times are available beginning at 11am, 48 hours in advance. For more information, visit www.wilddunes.com/golf or call 886-2002.